Born August 11, 1966, McCaslin grew up in in Santa Cruz, CA; inspired by his father, a pianist and vibraphonist, the youngster started playing tenor saxophone at 12, and quickly progressed, touring Europe and participating in the prestigious Monterey Jazz Festival’s California All-Star band while in high school. After attending the Berklee College of Music in Boston, he joined Berklee professor Gary Burton’s quintet, with whom he toured for four years. McCaslin moved to New York, in 1991, working with bassist Eddie Gomez and then joining the group Steps Ahead, with whom he made the 1995 disc Vibe (NYC Records). But he really began to turn heads with his solo work in larger ensembles – first Ken Schaphorst’s big band, and subsequently the acclaimed Maria Schneider Orchestra, where his performance on the album Concert In The Garden received a Grammy nomination for “Best Jazz Instrumental Solo” in 2004. Thanks to the high profile of the Dave Douglas Quintet, McCaslin in the last two years has achieved wider praise for the incisive twists and purposeful turns of his emotionally charged solos. But those qualities – along with his sometimes startling virtuosity, and his distinctive voice as a composer – had actually been on display for much of the previous decade, during which McCaslin proved himself a valued sideman on recordings by Danilo Perez, Luciana Souza, and performances with Tom Harrell, Brian Blade, John Pattitucci, The Mingus Big Band, and Pat Metheny. . Meanwhile, the previous albums under his own name have shown him subtly incorporating elements of Latin American music within adventurous jazz frameworks. 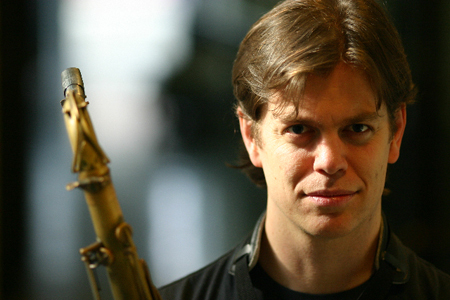 In 2006, McCaslin received a Doris Duke grant for new jazz composition from Chamber Music America; his album In Pursuit comprises the results of that work.